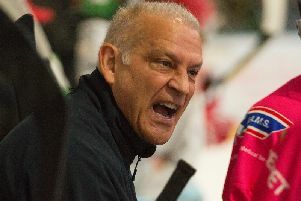 Two more losses consigned Milton Keynes Lightning to their worst ever run of consecutive defeats – seven in total – as their miserable season continued at the weekend. They went down 4-3 to Manchester Storm at Altrincham on Friday and 4-2 to Cardiff Devils on home ice on Saturday – Lightning eclipsing a six game winless streak in their first season in the Elite League which was in itself a record. Cardiff’s class was again too much and in truth had it not been for the heroics of deserved man of the match, Patrick Killeen, it could have been a cricket score. The Canadian goalie stopped all but four of the 56 shots fired on him and had Devils not eased up in the third period that total could have been far more. Leading 4-2 at the second break Devils slipped down a gear while retaining control of the outcome. Lightning tried in vain to find a way through, managing just 23 shots in total – less than Devils’ second period tally of 30. It was again a lesson in the gulf in quality – MK with precious few of the calibre to match that of the reigning league and play-off champions. Devils struck after just 1min 23secs when Charles Linglet beat Killeen before Lightning equalised on 7mins 37secs in strange circumstances. The goal judge’s light did not go on as a shot by Cole Shudra rebounded out as quickly as it went into net, leading to the suspicion that the puck had hit the metalwork. After much deliberation referees Matt Thompson and Tom Pering awarded the goal. The hosts took the lead for the only time when Tim Wallace shot through traffic at 14mins 15secs. Killeen kept Cardiff at bay early in the second period but he could do little though to stop Layne Ulmer’s top shelf shot for Devils’ leveller on 27mins 43secs. 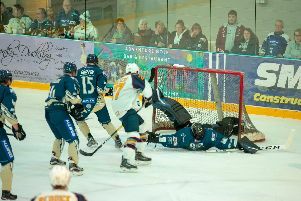 The visitors snatched the lead while the two teams were four on four – Neiley and Matt Pope called for roughing a few seconds before Sean Bentivoglio fired in from close range at 29mins 58secs. A four minute penalty on Killeen for tripping and subsequent unsportsmanlike conduct saw Devils wrap up the game with a fourth goal on 34mins 31secs through Ulmer. The previous night a brace from Robbie Baillargeon and a goal by Eric Neiley were not enough to prevent Manchester Storm from winning 4-3. Storm took the lead on 9mins 35secs when Evan Richardson found the net. Lightning suffered an early blow in the second session as, straight from a face off to the left of Killeen’s goal, the puck was pushed back to Dallas Ehrhardt and his blue line rocket eluded the netminder for Storm’s second just 31 seconds in. Baillargeon reduced the arrears at 23mins 22secs but the home outfit took the score to 3-1 when defenceman Harrison Ruop gave Killeen little chance. With a powerplay to start the third period Lightning took advantage of it as Eric Neiley tipped the puck in from close range just 46 seconds after the restart. Storm regained the two goal lead when Brendan Brooks made the supply to Ciaran Long who shot high into the goal to make it 4-2 at 45mins 43secs. There was a tense ending to the clash though after Baillargeon, at the far post, turned in an Owen Griffiths set up on 55mins 19secs to bring Lightning to within one goal of their opponents. However, despite a timeout and the withdrawal of Killeen for the extra skater in the final 40 seconds the visitors were unable to find the game tying goal to send the match into overtime.